The habitat for Flamingos is very diverse and they live in more places than many people realize. They tend to like it where the temperatures are warm, but they seem to do well in colder climates too. As long as they have room to roam and plenty off food they are content in any environment. This type of amazing adaptation is why they Flamingo has been able to survive for millions of years and is still going strong. You will also find the Flamingo residing in the Andes Mountain range and in regions throughout South America. Many people are surprised to learn that Flamingos live in the mountain areas as they always thought they were strictly flat land animals. They tend to enjoy regions where there is plenty of water or mud for them. This is why you find them close to lagoons, lakes, and swampy areas. They live in waters that are alkaline in nature so if the balance changes and there is too much acid they won’t be able to survive in it. You will find them happily residing in both the tropic and subtopic regions. They need the salt in the water for the food sources that consume but their bodies extract that salt. They need to live in a region where they also can get plenty of fresh water. 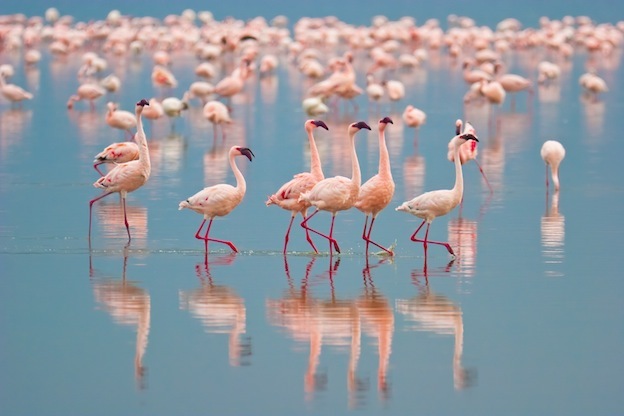 One of the biggest threats right now to the natural habitat of the Flamingo takes place in Tanzania around Lake Natron. This is do to a factory in the area that produces soda in this part of Africa. The amount of salt in the water changes often due to this plant and that makes it hard for the Flamingos to always find enough food or enough fresh water to survive. Pollution in this particular lake as well as many others though continues to destroy the natural habitat of the Flamingo. For example in Kenya 20,000 of them died due to pollution in 1993. This was the result of bacteria coming from pesticides and toxic substances used in the area. These types of ailments are very difficult for the locations of Flamingos to recover from. It seems that the larger the size of the colony is, the more of them will fall victim to such problems. Many Flamingos live in captivity at zoos and wildlife parks around the world. They seem to adapt very well to such a lifestyle. However, many people argue that keeping them in captivity isn’t a good idea. Instead they feel more efforts should be done to clean up their natural environments. Next the focus should be on preservation so that they don’t fall victim to problems down the road. Finally, they would like to see Flamingos in captivity reintroduced to safe locations in the wild. In many areas though there are efforts in place to reintroduce Flamingos to habitats that they once lived in but have been forced out of. There are also more locations being preserved for the wildlife than in the past. These lakes, swamp regions, and even lagoons have been cleaned up enough that they can successfully live in these areas where they once were faced with diseases like I mentioned above. You will notice that the places where Flamingos are found in captivity aren’t always those with tropic or subtopic temperatures. The fact that they are fed food pellets instead of having to forage for their own food though means that this is possible. Their bodies seem to adjust to a variety of temperatures so it has more to do with the opportunity for food than for their own body functions.